A great re-make of this primary hybrid, this time using the awarded clone of Phal amboinensis, ‘Carriage Hill Gold’ as the pod parent! Phal. amboinensis contributes its bold yellow background with Phal. bellina rounding out the segments. The potential progeny from this hybrid can show enhanced gold barring, a soft expansion of the barring over the entire flower or possibly some solid chestnut red clones with the barring suffusing over the entire flower. 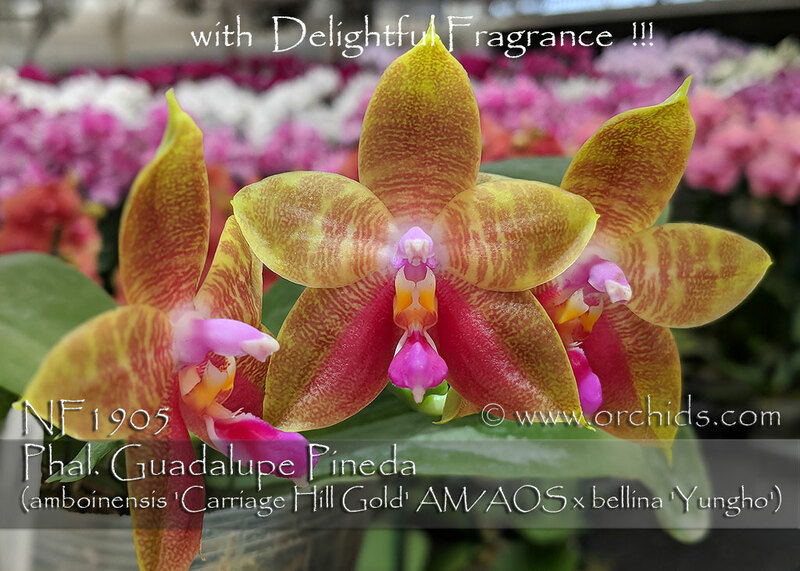 All will carry a delightful fragrance from both parents with compact inflorescences cascading over its leaves. A great re-make that will provide enormous potential for breeding new novelty hybrids. Highly Recommended! , Note: Delightful Fragrance .